Cjm Fiscal Management Inc., 9780990549017, 96pp. Charlie Massimo knows what Wall Street is hiding because he spent two decades on the front lines at major financial firms. Feeling disillusioned by his employers' profit-driven motives, Massimo left Wall Street to start his own firm. 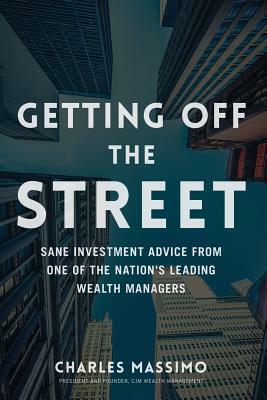 Getting Off the Street offers honest, realistic investment advice based on Massimo's experience helping hundreds of clients achieve their financial vision. His method, called structured investing, has helped clients weather devastating market crashes while investment giants suffered major losses, but you won't hear about it from Wall Street advisors because they can't profit from it. Told with Massimo's signature warmth, clarity, and wisdom that can only come from three decades on and off "The Street," this book will help you achieve your financial goals and build the life you desire.